Great, wide pillows. They're a bit tough on my neck because they're really high... I might need to get some flatter, more firm supplementary pillows. For a limited time, we are offering an assorted twin pack collection. Queen size pillow includes brands like Hanes, Jennifer Adams, Laura Ashley, Eddie Bauer, and Tommy Bahama. These pillows are priced to move. Some have a gusset while others do not. Most are medium-firm in density. All are hypoallergenic polyester fiber fill. Dimensions 30.0 In. X 20.0 In. X 5.0 In. I bought these pillows as fillers for my queen size shams. They are not queen size. I already had standard size pillows. Now I have 2 more. I am disappointed with this purchase. I received 2 sealy pillows. I liked the firmness of them. They do seem a bit small as having them side by side on my queen bed they don't even come close to spanning the width of the bed. They look a little funny because of their small size.Just don't fill up the space on a queen. These pillows are not queen-size and they are not firm. However I will keep them for company. Now, I need to find a REAL queen-size. These pillows are great. They arrived on time, and they are Sealy brand. They are very comfortable and good size. These pillows are a great surprise!!! They're marvelous! I wasn't sure what I would be receiving, but they are no joke they're an excellent set of pillows. I'll definitely be moving some pillows around the house because these 'surprise' Hypoallergenic Sealy cotton pillows are going on my bed also! What a treat Overstock! I am very pleased with these pillows. They arrived yesterday and my husband and I slept on them last night. They are very well made and a good brand. In the past I have slept on two pillows but these are large enough I only needed one pillow. 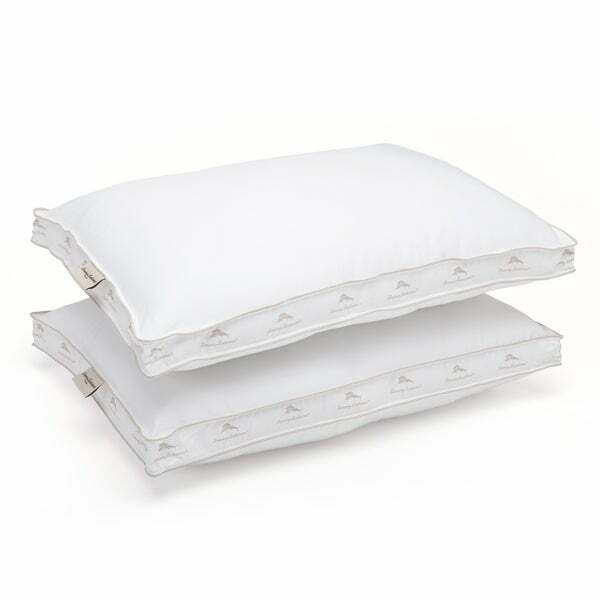 I recommend these pillows for their quality and also for the price being very good. I think anyone would be happy to get these pillows. As a bonus they are machine washable. I always check on Overstock before I make a purchase. These are excellent pillows for the money! My teenage son was having issues sleeping well and neck pain. Clearly he needed better pillows than the $5 ones you get at the big box stores, but I was reluctant to spend the money of the high end pillows I have on my bed. These pillows seemed to be a good middle of the road investment. Better quality pillows but at $***/each the price was right. I was hoping they would make a difference for him and wow did they! Good quality, very comfortable and supportive, and awesome price! I have bought 2 more sets for all the beds in our house. Went flat really really fast! These Special Mystery pillows were a pleasant surprise for the price! I gave them as a gift with another item and they were a popular brand of good quality. The receiver was very pleased. Great pillow. Have been using and hold up well. Pillow can be difficult to buy but overstock makes it easy. Nothing special. Could have gotten as good a deal in the store. Great pillows. Not too hard, not too soft. Nice price and good reviews. Just looking for two basic pillows, I’m not super particular.